Ramen is one of those amazing comfort foods you crave on a cold winter day! With the recent cold spell here in Seattle, the high today is 33 degrees Fahrenheit, you can imagine why hot broth and noodles sound so appealing. Loaded with fresh vegetables, and a creamy broth dripping from soft but slightly chewy curly noodles - that's where it's at. Now, if you are like me, while ramen sounds amazing, spending 2 to 3 hours making the perfect broth does not. Instant ramen packets are not even worth considering in my opinion, they lack the flavor, the fresh veg, and are loaded with sodium (around 800 mg per packet!) even if you opt for the organic brands. 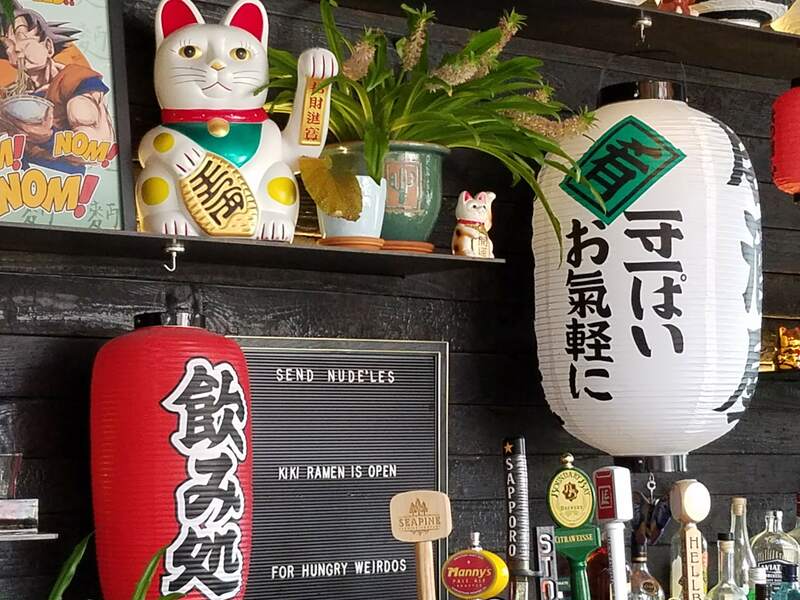 And while it's easy in South Lake Union to get your ramen fix from local favorite, Kiki Ramen, making your own doesn't have to be difficult. While we won't be making the delicious black garlic oil or have a broth quite as rich in flavor as Kiki, we will have a satisfying, delicious, and nutrient dense bowl of ramen in less than 40 minutes - and we will have made enough to eat ramen for a few days for much less than it would cost to dine out. Side note: If you'd like to see me do a review of Kiki Ramen in South Lake Union Seattle, leave me a comment below! Ramen is an awesome candidate for meal prep. You can chop all your vegetables and make your broth in advance, then when it comes time for a meal your tasks are simple. 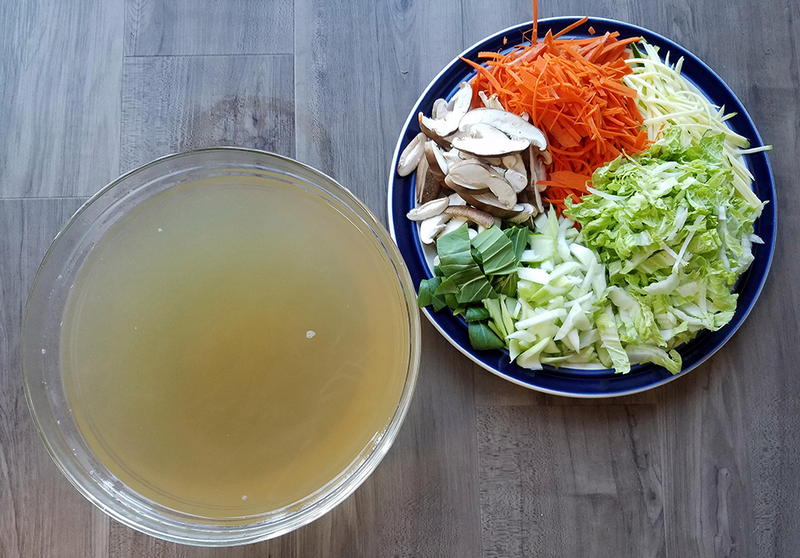 Heat up your broth, boil your fresh or frozen noodles in the broth and top with your vegetables of choice (which can be raw for the most time saving, quick blanched to soften slightly or sauteed), and top with some extra tamari or toasted sesame oil of your choosing. Dinner is done, usually in less than 15 minutes! My favorites to top my ramen include a variety of vegetables in various colors and textures. Adding the extra colors ensures it not only looks Instagram worthy, but provides your body with a variety of nutrients. I like to julienne, thinly cut strips, carrots and squash and top them raw or blanched for 30 seconds in boiling water with a quick strain. Shiitake or any other mushroom I have on hand sauteed just till they have a nice color with some fresh garlic is sometimes all I need for a great bowl of ramen. 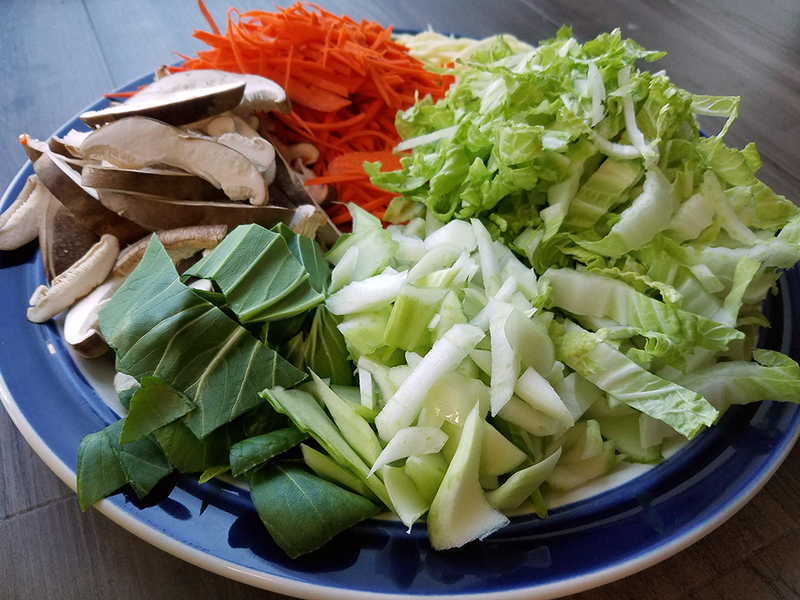 Quickly blanched spinach, bok choy or cabbage is also a lovely addition to any ramen bowl. Another favorite around my house, fresh corn! The natural sweetness pairs very well with the salty broth and is good practice for your chop stick skills. Ramen noodles can come fresh, frozen, dried or even from those instant packets you can buy on the cheap (keep the noodles, toss the seasoning packet). My personal favorite is fresh noodles but those aren't easy to come by in South Lake Union. 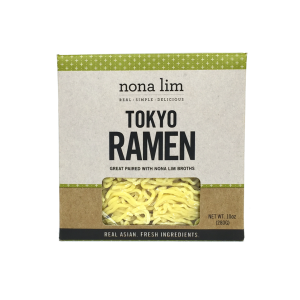 I like to keep Nona Lim authentic Tokyo Ramen noodles in my freezer, which are readily available at most Whole Foods in the frozen foods section. Each box comes with two packets and they are large portions, easily split into two servings if you are serving your ramen with a heaping pile of glorious toppings, making them more budget friendly. My ingredients are all organic. In a large dutch oven or stock pot, fill it with water to within 2" of the top (allow room to rapid boil) and bring to a boil over high heat. Meanwhile, cut your leek in half and into 4" segments. Tie with kitchen twine. Once your water is boiling, add your leek, bouillon, garlic and ginger to your pot. Let boil 30 minutes. Strain out solids with a spider net or using tongs, add the tamari, stir and store in the refrigerator. To prep your vegetables, julienne your carrots and zucchini. Lightly wash the tops of your shiitake with a damp cloth to remove any excess dirt if needed. Slice into strips. Thinly slice your cabbage into long ribbons. Pull apart your bok choy. Wash well and cut off the bottom 1/4". Seperate the leafy bit from the stalk. Slice the stalk into thin strips and cut the leafy bit into big chunks if necessary. Store everything in the refrigerator till ready to eat, up to 4 days. Bring two cups of liquid (per person) to a boil. Meanwhile, blanch any vegetables you may want to cook slightly and saute any mushrooms and bok choy stalks with fresh garlic. Put your noodles directly in the boiling broth, following package instructions for cooking. Note: If your broth is boiling for too long it may reduce down. If it does, and it tastes too salty, add a quarter cup of water at a time to taste. Place noodles and broth into bowls, top with any optional ingredients you may want and serve. Vegan "Quickie" Ramen Meal Prep - Live from Twitch! Previous: Previous post: What happens if I quit social media for a month?